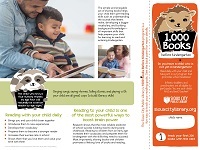 Read with your child and celebrate reading milestones with us! Children who hear at least 1,000 books before kindergarten have greater success learning to read, and we’re here to help. Infants, toddlers, and preschoolers are all eligible to participate. 1. 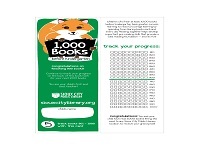 Visit any Sioux City Public Library location to receive a tracking card, or download and print the first card. 2. Mark one of the boxes each time your child enjoys a book. · Books can be counted again and again. Repetition is good for learning new words! 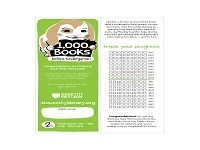 · Count books your child hears in storytime, in daycare or preschool, and with a friend or family member. Listening to books is the goal! 3. 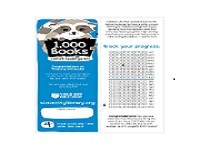 Bring your completed card to any of the Sioux City Library locations, and we’ll celebrate the accomplishment with you! 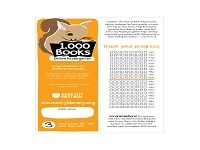 During your visit to the Library, you’ll also receive the next card to continue tracking books, or you can download and print the next card to continue tracking your progress.